Azam Khan, M., Ahmad, W., Khan, S., Rahim, H., Roohullah, R., Amin, F. (2012). Formulation and Evaluation of Sustained Release Tablets Using Prunus armeniaca (L.) and Prunus domestica (L.) Gums. Iranian Journal of Pharmaceutical Sciences, 8(4), 233-240. Mir Azam Khan; Waqar Ahmad; Salimullah Khan; Haroon Rahim; Roohullah Roohullah; Fazli Amin. "Formulation and Evaluation of Sustained Release Tablets Using Prunus armeniaca (L.) and Prunus domestica (L.) Gums". 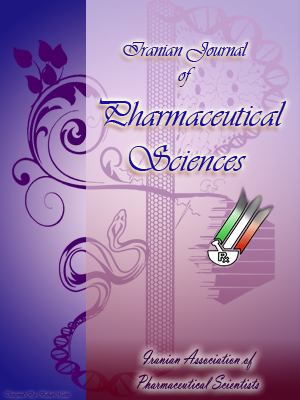 Iranian Journal of Pharmaceutical Sciences, 8, 4, 2012, 233-240. Azam Khan, M., Ahmad, W., Khan, S., Rahim, H., Roohullah, R., Amin, F. (2012). 'Formulation and Evaluation of Sustained Release Tablets Using Prunus armeniaca (L.) and Prunus domestica (L.) Gums', Iranian Journal of Pharmaceutical Sciences, 8(4), pp. 233-240. Azam Khan, M., Ahmad, W., Khan, S., Rahim, H., Roohullah, R., Amin, F. Formulation and Evaluation of Sustained Release Tablets Using Prunus armeniaca (L.) and Prunus domestica (L.) Gums. Iranian Journal of Pharmaceutical Sciences, 2012; 8(4): 233-240. 1Department of Pharmacy, University of Malakand, Chakdara, Dir (Lower), Khyber Pakhtunkhwa, Pakistan. 2Department of Pharmacy, Abdul Wali Khan University, Mardan, Khyber Pakhtunkhwa, Pakistan. 3Department of Pharmacy, Sarhad University of Science and Technology Peshawar, Khyber Pakhtunkhwa, Pakistan. 4Department of Pharmacy, Abasyn University of Peshawar, Khyber Pakhtunkhwa, Pakistan. 5Gandhara College of Pharmacy, Gandhara University Peshawar, Khyber Pakhtunkhwa, Pakistan.